Archaeology in the Central West of NSW. Since 1996 Ted Higginbotham has provided heritage advice and archaeological services to Cadia Holdings Pty Ltd, part of Newcrest Mining Ltd, the largest Australian goldmining company. The company has constructed a large goldmine at Cadia, south of Orange, on and around the site of the historical copper mines, commenced in the late 1850s. The archaeological work has developed into a historical community and landscape archaeological project with the excavation of Cadia Cemetery, part of Cadia Mining Village, Copper Smelter No. 1, Little Cadia Copper Mine and several surrounding farms. 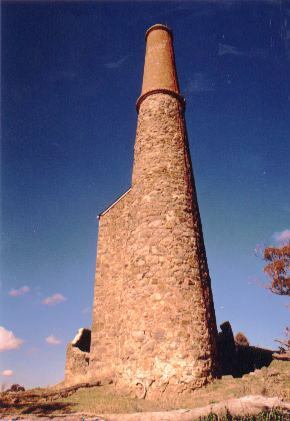 Cadia is the site of the only Cornish engine house in NSW, listed on the NSW State Heritage Register. Cadia has strong links with Cornish migration to Australia. Since 2005, Ted Higginbotham has researched the major historical copper mines in South Australia and the mining landscape of Cornwall and West Devon, UK. See South Australia and United Kingdom study tours. Other projects in the Central West include the excavation of Lithgow Pottery in 1982, the survey of Junction Reefs Gold Mine in 1984, the survey of rural settlement at the Ben Chifley Dam in 1999 and investigation of the Great Blayney Copper Mine in 2004 and 2005. See reports. Test Trenches - Cadia Mining Village, 1860s. The invisible miner’s hut - Miner’s Huts, Cadia Village, 1860s-1920s. Finding a needle in a haystack – Historic farmsteads, “Tunbridge Wells”. The chimney of the Cornish engine house at Cadia.